LOUISVILLE, Ky. (Tuesday, May 2, 2017) – Godolphin Racing’s Thunder Snow (IRE) exited quarantine Tuesday morning and made his first visit to the main track at Churchill Downs. Going out during the special training period reserved for Kentucky Derby and Oaks horses at 8:30, Thunder Snow jogged a mile and cantered a mile. Also making their initial appearances on the track were Monday arrivals Irish War Cry, Gormley and Royal Mo for the Derby and Oaks hopefuls Mopotism and Paradise Woods. Later Tuesday morning, 14 fillies were entered for Friday’s $1 million Longines Kentucky Oaks (Grade I) with Steven Sarkowsky and Pam and Marty Wygod’s Paradise Woods being made the 5-2 morning-line favorite. Also, Juddmonte Farms’ Lockdown had a three-furlong blowout for trainer Bill Mott, covering the distance in :35 in company. Exercise rider Nick Bush summed up Day 2 of the “draw reins” experiment succinctly following his mile and a sixteenth gallop with Always Dreaming at 5:50 Tuesday morning at Churchill Downs. The Florida Derby (GI) winner, a colt who has been described as feeling so good of late he was “jumping out of his skin,” had an adjustment to his morning routine Monday when Bush took over as his pilot and the longer, stronger “draw reins” were added to his gear, giving the rider more leverage and the ability to force the horse to drop his head while galloping. The changes took some adapting to by the 3-year-old son of Bodemeister at first – he bucked and pulled against the new setup Monday — but for the second go-round he was going smooth. Always Dreaming’s stellar race record in 2017 (three for three, including the Florida Derby), along with his series of extra sharp bullet workouts, had the colt down as the possible favorite on more than a few scorecards coming up to Derby 143. But his feeling-so-good-he’s-going-to-jump-over-the-moon morning M.O. the past week left his connections with concerns he might scatter his P.M. power with A.M. antics. The changes put in place by Pletcher appear to have allayed those fears and to have channeled his energy in a more positive fashion. It now appears likely that the rest of Derby Week will flow in a much calmer fashion for the precocious Kentucky-bred and his backers. The trainer’s other two Derby hopefuls went about their business in near ho-hum fashion, covering a mile and a half in good gallops during the 8:30-8:45 a.m. special training period for Derby and Oaks contenders. Patch had his usual exerciser rider Isabelle Bourez in the saddle, while Tapwrit had his regular guy, Silvio Pioli, on board. Pletcher noted further that Always Dreaming would paddock this afternoon with horses for the day’s sixth race. He also said that the other two colts would do afternoon paddock duty Wednesday. BATTLE OF MIDWAY – WinStar Farm and Don Alberto Stable’s Santa Anita Derby (G1) runner-up Battle of Midway galloped 1 1/2 miles under regular exercise rider Edgar Rodriguez and stood in the starting gate on Hall of Fame trainer Jerry Hollendorfer’s first morning overseeing her preparations at Churchill Downs. “He’s doing just fine,” Hollendorfer said. CLASSIC EMPIRE/STATE OF HONOR – Trainer Mark Casse’s duo of Classic Empire, ridden by Martin Rivera, and State of Honor, with Orlando Cross up, galloped 1 ½ miles Tuesday morning at Churchill Downs. “Both horses are doing very well,” Casse said. Classic Empire and State of Honor schooled in the paddock Tuesday during Churchill Downs’ first race. FAST AND ACCURATE – Kendall Hansen, Skychai Racing, Sand Dollar Stable and Bode Miller’s Fast and Accurate jogged two miles at 6 a.m. under exercise rider Joel CanoTuesday morning at Trackside Louisville. Trainer Mike Maker confirmed that the Spiral (GIII)-winning son of Hansen will make the 15-minute ship to Churchill Downs on Tuesday afternoon. He goes into Barn 27. Channing Hill, who was aboard for his graduation this winter at Turfway Park, rides in what will be his first Kentucky Derby (GI). GIRVIN – Brad Grady’s Louisiana Derby (GII) winner Girvin went out at 6 a.m. at Keeneland and galloped a mile for trainer Joe Sharp. The dark bay son of Tale of Ekati also won the Risen Star (GII) on Feb. 25 among his three victories from four starts. His lone loss was a turf try at second asking three weeks prior in the Keith Gee Memorial at Fair Grounds. In his debut, he outfought highly regarded multiple allowance winner Excitations, who is expected to run in the $250,000 Pat Day Mile (GIII). Sharp, a 32-year-old West Virginia native, will have his first Kentucky Derby starter with Girvin. GORMLEY/ROYAL MO – Trainer John Shirreffs’ pair of Gormely and Royal Mo got their first feel for the Churchill Downs strip Tuesday morning after being flown in from Southern California Monday. Shirreffs, aboard a borrowed pony named “Bucky,” led Royal Mo to the racetrack at approximately 7:40. They stood near the outer rail inside the six-furlong gap for several minutes before exercise rider Cisco Alvarado slowly jogged off on his own and then circumnavigated the big oval twice in an easy gallop. “He handled it fine; no problems,” Alvarado reported afterward back at Barn 42. Gormley, the Santa Anita Derby (GI) winner, went to the track at 8:30 during the special Derby/Oaks training period. Again, Shirreffs on his pony led his charge onto the track through the six-furlong gap, then let them go about their business on their own. Gormley and Alvarado did two tours of the track and the rider opined all was good afterward, saying “he likes this track.” Shirreffs was of a like mind: “It went very well,” he added. Unlike his barnmate, Gormley is a go for Derby 143 and he’ll have the saddle services of the just-voted-in Hall of Famer Victor Espinoza, who already has won the Run for the Roses three times. Espinoza was on hand Tuesday morning at the barn, having flown in on the private jet of the horses’ owner Jerry Moss, the music titan who laughed and shook hands as he joined in on the morning activities. Moss, of course, had teamed with Shirreffs at Churchill Downs back in 2005 to pull off a major surprise in Derby 131 when their 50-1 shot took his cues from rider Mike Smith and came rushing home to prove a half-length best in that year’s edition of the Run for the Roses. Yet another taking in the scene at the barn Tuesday was the master of Spendthrift Farm, B. Wayne Hughes. The veteran breeder has a two-way rooting interest in Gormley come Derby time Saturday. First, he stands the horse’s sire, Malibu Moon, at his Kentucky farm. Secondly, he inked a deal a few weeks back to have Gormley stand a Spendthrift when his racing days are done. GUNNEVERA – Peacock Racing Stables’ Gunnevera galloped 1 ½ miles under exercise rider Victor O’Farrel at Churchill Downs Tuesday morning. Trainer Antonio Sano admits to getting excited about the Fountain of Youth (GII) winner and Florida Derby (GI) third-place finisher’s chances in Saturday’s Kentucky Derby. Sano, who saddled more than 3,300 winners in Argentina, was kidnapped twice – the last time held for ransom for 36 days in 2009 – recently celebrated his 500th victory in the U.S. Having a chance to win the world’s most prestigious race on Saturday has been occupying all of his thoughts. Sano plans to paddock school Gunnevera Wednesday morning. Lookin At Lee and Untrapped had nearly identical works, completing their moves in :50.20 and :50.40, respectively, while Hence was the fastest of the three, going the distance in :48.40. Lookin At Lee is the most experienced of the three having already danced many of the big dances starting last year when he finished second in the Breeders’ Futurity (GI) and fourth in the Breeders’ Cup Juvenile (GI) behind likely Kentucky Derby morning-line favorite Classic Empire. He was most recently third behind that same rival in the Arkansas Derby (GI). Untrapped will be looking to rebound from a sixth-place finish in the Arkansas Derby after finishing second in two prep races at Fair Grounds and third in the Rebel Stakes at Oaklawn. IRAP – The Blue Grass Stakes (GII) winner went trackside during the special Derby/Oaks training period Tuesday morning under regular exercise rider Tony Romero. The pair put in a mile and one-eighth gallop around the big oval and Romero gave it a thumbs up afterward. Assistant trainer Leandro Mora oversaw the exercise and reported that both trainer Doug O’Neill and owner Paul Reddam were inbound for Louisville and would be at Barn 41 later in the day. Irap will be ridden by Mario Gutierrrez Saturday. IRISH WAR CRY – Isabelle de Tomaso’s Irish War Cry was introduced to the Churchill Downs racetrack Tuesday morning while galloping approximately a mile under exercise riderDavid Nava. Trained by Graham Motion, the son of Curlin arrived at Churchill Downs late Monday afternoon following a van ride from Fair Hills Training Center in northeast Maryland. Motion saddled Animal Kingdom for a Derby victory in the 2011. Irish War Cry will attempt to join Regret (1915) and Cavalcade (1934) as the only New Jersey-bred horses to win the Kentucky Derby. Irish War Cry also will try to become the first Wood Memorial (GII) winner since Fusaichi Pegasus (2000) to capture the Kentucky Derby. Funny Cide, the 2003 Wood Memorial runner-up, was the most recent winner of the Kentucky Derby who had previously run in the Wood. The Motion trainee rebounded from a disappointing off-the-board finish in the Fountain of Youth (GII) at Gulfstream Park to capture the Wood Memorial at Aqueduct by 3 ½ lengths. “We’re here to defend the Wood,” Motion quipped. “It lost its Grade I status last year. I’ve run in it twice and actually won it twice. I also won it with Toby’s Corner, who would have done very well in the Derby and it just so happened that Animal Kingdom won it that year. How lucky am I to be in that position? Irish War Cry is scheduled to gallop and school in the paddock Wednesday morning. J BOYS ECHO – Albaugh Family Stable’s J Boys Echo galloped 1 ½ miles Tuesday morning at 8:30 with regular exercise rider Tammy Fox aboard for trainer Dale Romans. McCRAKEN – Whitham Thoroughbreds’ McCraken had a regularly scheduled walk day Tuesday at trainer Ian Wilkes’ barn. The two-time graded stakes winner was scheduled to school in the paddock Tuesday afternoon with horses in the fifth race. McCraken will represent the first Derby starter for Wilkes and for jockey Brian Hernandez Jr., his second Derby mount. But the Wilkes-Hernandez team has struck big-time gold before. In 2012, Hernandez celebrated his 27th birthday in grand style by riding the Wilkes-trained and Whitham-owned Fort Larned to victory in the Breeders’ Cup Classic (GI) at Santa Anita. Hernandez had picked up the mount on Fort Larned midway through the colt’s 4-year-old season. He has been with McCraken all along, beginning with the colt’s debut at Churchill Downs on Oct. 2. PRACTICAL JOKE – Klaravich Stables and William H. Lawrence’s Practical Joke galloped about 1 ½ times around the Churchill Downs oval under exercise rider Fernando Riveraduring the Kentucky Oaks and Derby training session. “He galloped well and he stood in the gate,” trainer Chad Brown said. After working in small-cup blinkers since finishing second in the Blue Grass Stakes (GII) last time out, Brown has decided not to use them in the Derby. SONNETEER – Calumet Farm’s Sonneteer returned to the track to jog Tuesday, one day after firing a bullet half-mile in :47.20 over a “good” track Monday under jockey Corey Lanerie. Assistant trainer Julie Clark reported he was doing “great.” Trainer Keith Desormeaux is scheduled to arrive Wednesday. THUNDER SNOW – Godolphin Racing’s homebred UAE Derby (Group II) winner Thunder Snow made his first appearance on the Churchill Downs main track Tuesday morning since clearing quarantine, jogging once around before cantering a mile under Godolphin exercise rider Daragh O’Donohoe. “We wanted to make sure he had a nice jog before we cantered him off and it was a good idea because he’s never had people so close around him,” O’Donohoe said. “That was the first time he’d been with a pony, as well; it was a good lesson. “It was really nice to get him out because he was getting pretty fresh in that barn. He’s got a very high recovery rate so there’s not a lot that fazes him. He was pretty professional out there on the track and I was actually pretty surprised because we’re used to our own private gallops at Al Quoz in Dubai. We don’t see a lot of traffic so his behavior this morning was exceptional. He floated over the track and I had no problems on him. He moved well, he’s breathing well. He changed leads a couple times on the bend. I was really happy. O’Donohoe, who retired from race-riding in 2015, was named aboard Aljabr for Godolphin in the 1999 Kentucky Derby but the horse was scratched the day before the race. 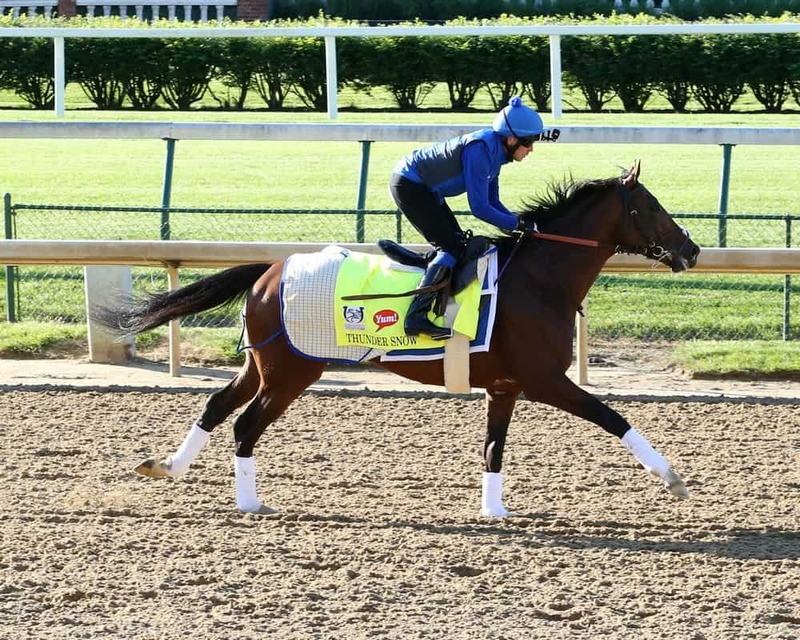 SHAPING UP: THE KENTUCKY DERBY – Likely starters in the 143rd running of the $2 million Kentucky Derby Presented by Yum! Brands (GI) to be run for 3-year-olds at 1 ¼ miles on Saturday, May 6: Always Dreaming (John Velazquez), Battle of Midway (Flavien Prat), Classic Empire (Julien Leparoux), Fast and Accurate (Channing Hill), Girvin (Mike Smith), Gormley (Victor Espinoza), Gunnevera (Javier Castellano), Hence (Florent Geroux), Irap (Mario Gutierrez), Irish War Cry (Rajiv Maragh), J Boys Echo (Luis Saez), Lookin At Lee (Corey Lanerie), McCraken (Brian Hernandez Jr.), Patch (Tyler Gaffalione), Practical Joke (Joel Rosario), Sonneteer (Kent Desormeaux), State of Honor (Jose Lezcano), Tapwrit(Jose Ortiz), Thunder Snow (Ire) (Christophe Soumillon) and Untrapped (Ricardo Santana Jr.). Next up in order of preference: Royal Mo (Gary Stevens), Local Hero (TBA), Master Plan (TBA) and Petrov (TBA). ABEL TASMAN – China Horse Club and Clearsky Farms’ Santa Anita Oaks (GI) runner-up Abel Tasman galloped under regular exercise rider Dana Barnes while outfitted with blinkers as Hall of Fame trainer Bob Baffert looked on. “She was a little bit lost out there yesterday,” Baffert said. “She likes to look around a lot. I think the blinkers are going to make a big difference. When I first got her Simon(Callaghan, her previous trainer) told me she’d been sick so I went real easy with her for a week. And then she got away bad in that race, but she wasn’t going to beat Paradise Woods. Abel Tasman finished nearly 12 lengths behind Paradise Woods in the Santa Anita Oaks. Abel Tasman, the 5-1 co-third choice on the morning line, drew post 13. DADDYS LIL DARLING – Normandy Farm’s Ashland (GI) runner-up Daddys Lil Darling will break from post position 12 in Friday’s Kentucky Oaks. Daddys Lil Darling jogged Tuesday morning at 5:45 and is scheduled gallop Wednesday. EVER SO CLEVER – Clearview Stable‘s Fantasy Stakes winner Ever So Clever returned to the track Tuesday and galloped once around under Angel Garcia. She had walked Mondayafter completing her Oaks preparations Sunday with a half-mile breeze that trainer Steve Asmussen called “spot on.” She was scheduled to school in the paddock during Tuesday’s fourth race. Ever So Clever, listed at 20-1 on the morning line, drew post position one and will have Luis Contreras aboard Friday. “The post wouldn’t have been our first choice,” Asmussen said. FARRELL – Coffeepot Stables’ Wayne Catalano-trained Farrell left Barn 30 at 8:25 a.m. and was the first horse on the track for the special training session. Escorted by Sara Tittle on a pony and with exercise rider Antonio Ramos up, the three-time GII winner walked the paddock and schooled in the gate before galloping a “long mile and a half,” according to assistant conditioner Fernando Canteria. She is expected to school in the paddock during Tuesday’s second race. In the post position draw, the daughter of Malibu Moon drew favorably in the seven hole, one of the posts for which jockey Channing Hill hoped. She was assigned 5-1 third-choice morning-line odds. “I do like the seven,” Catalano said. “When I school her, I have been putting her in the seven, so it came out how we’ve been putting her in there. A three-time Breeders’ Cup winner overall, Catalano won two of those at Churchill Downs — Dreaming of Anna in the Juvenile Fillies (GI) in 2006 and Stephanie’s Kitten in the Juvenile Fillies Turf (GII) in 2011. He last raced in the Kentucky Oaks in 2014 with Aurelia’s Belle, whom Hill piloted to a ninth-place finish of 14. Farrell has four graded stakes victories around two turns, but has yet to win at the nine-furlong distance of the Kentucky Oaks. Catalano is not worried about an increase in trip. “She’s had a few under her belt, so I don’t think it’s going to be a problem,” he said. JORDAN’S HENNY – Erv Woolsey and Ralph Kinder’s Jordan’s Henny galloped a little more than a mile and a half under exercise rider Edgar Cano after the morning renovation break. Trained by Mike Tomlinson, Jordan’s Henny drew post position five and is listed at 30-1 on the morning line. LOCKDOWN – The Juddmonte Farms homebred Lockdown posted the only official work during the Oaks and Kentucky Derby training session, a three-furlong “blowout” from the three-eighths marker to the finish line in :35 under exercise rider Jo Lawson. The move came in company with Naples Princess, a 3-year-old filly who broke her maiden here last fall and is coming up on her 2017 debut. Churchill clockers recorded splits of :11.40 and :23 for Lockdown, as well as a half-mile gallop out into the clubhouse turn in :48.60. MISS SKY WARRIOR – Arlene’s Sun Star Stable’s Kelly Breen-trained Miss Sky Warrior left Barn 43 at 8:30 a.m., escorted by her conditioner on a pony and proceeded to gallop one mile on the main track at Churchill Downs with exercise rider Aurelio Gomez in the saddle. Entering the Kentucky Oaks off five consecutive victories, including four graded stakes and a 13-length romp last out in the Gazelle (GII) at Aqueduct, the daughter of First Samurai is expected to be forwardly placed. Drawing well, she will break from post 10 with regular jockey Paco Lopez in the saddle. She was assigned 9-2 morning-line odds, making her second choice behind Paradise Woods (5-2, post four). MOPOTISM – The Uncle Mo filly Mopotism, who races in the silks of California’s Paul Reddam, got her first feel for the racing surface at Churchill Downs Tuesday morning when she went trackside during the special Derby/Oaks training period under former rider Amir Cedeno. The double winner did a single tour of the strip and handled it well, said assistant trainerLeandro Mora, who oversaw the activity in the place of trainer Doug O’Neill, inbound from California. Later in the morning, Mopotism drew post 3 for Friday’s 14-horse Oaks. PARADISE WOODS – The Santa Anita Oaks (GI) winner Paradise Woods was introduced to the racetrack at Churchill Downs Tuesday morning, slipping through the six-furlong gap just after 7 o’clock with former rider-turned-exercise-rider-and-assistant-trainer-for-Richard Mandella Alex Bisono in the tack. Mandella and his wife Randi looked on trackside as their precocious daughter of Union Rags went through a nice gallop of a mile, a move that had Bisono offering “she loved the track” a few minutes later Barn 42. The trainer was happy with the exercise and holds high hopes for his charge, who only has three starts to her credit as she steps up to her demanding assignment Friday in the nine-furlong Kentucky Oaks (GI). Mandella’s record in Churchill’s two biggest races – the Kentucky Derby and the Kentucky Oaks – do not lend themselves to bragging. He’s 0-for-6 in the Derby, with his best finish a fifth by Soul of the Matter in 1994. In the Oaks, he’s 0-for-3 with his best effort a second by multiple-champion Beholder, who – unfortunately — threw a wing-ding in the post parade (unseating rider Garrett Gomez), then acted up in the gate prior to her second to Princess of Sylmar. Mandella has not come up totally empty at the Louisville track, however. He shows nine victories here over the years, including several notable stakes scores. Still, he’d like nothing better than to put an Oaks on his ledger come Friday. The Hall of Fame conditioner, who has a Hall of Fame wit about him, cracked wise following the post position draw Tuesday morning in which he was assigned post 4 and given the role of favorite at 5-2. On a more serious note, he said he’d afternoon paddock Paradise Woods on both Wednesday and Thursday during the races. SAILOR’S VALENTINE – Semaphore Racing LLC and Homewrecker Racing LLC’s Sailor’s Valentine left Barn 31 at 8:35 a.m. with exercise rider Kelly Wheeler aboard and trainer Eddie Kenneally on pony. The Ashland (GI) winner galloped a mile on the Churchill Downs main track and promptly returned to her barn. The gray daughter of Mizzen Mast drew post eight in the 14-filly Kentucky Oaks (GI) field. She was assigned 30-1 morning-line odds and will be ridden by Corey Lanerie. SALTY/SUMMER LUCK – Gulfstream Park Oaks (GII) winner Salty will break from post position 14 in this Friday’s Kentucky Oaks for trainer Mark Casse. Salty galloped 1 ½ miles Tuesday morning under exercise rider Janelle Castonguay. The lone horse on the also-eligible list for the Kentucky Oaks is Gary Barber’s Summer Luck for Casse. The daughter of Lookin At Lucky galloped 1 ½ miles Tuesday morning at 8:30 with Froylan Garcia aboard. Salty will be ridden in the Oaks by Joel Rosario while Javier Castellano has the call on Summer Luck should she get in the field. TEQUILITA – Dorothy Alexander Matz’s Tequilita was a bundle of energy Tuesday morning while galloping 1 3/8 miles under exercise rider Jo Robinson at Churchill Downs. Tequilita, who captured the Forward Gal (GII) and finished second in the Gulfstream Park Oaks (GII), drew post position 11 at Tuesday’s draw for the Kentucky Oaks. “I think it’s fine. The speed is on the inside, so it’s no problem,” said Matz, whose trainee is listed at 20-1. VEXATIOUS – Calumet Farm’s Vexatious visited the starting gate and galloped one mile under exercise rider Freddy Quevero, according to Hall of Fame trainer Neil Drysdale, who then grazed her behind Barn 42 after training hours. The full sister to multiple Grade 1 winner Creative Cause and last year’s Belmont Stakes runner-up Destin inspired Kentucky Oaks dreams from the time she hit the track. Vexatious drew post six and was assigned 20-1 odds on the official morning line. WICKED LICK – Lee Mauberret’s Wicked Lick galloped a mile and a quarter and stood in the starting gate after the renovation break under exercise rider Leo Garcia. Trained by Brendan Walsh, Wicked Lick drew post position nine for Friday’s Oaks and is 30-1 on the morning line. Brian Hernandez Jr. will have the mount. The field for the Longines Kentucky Oaks with jockey and morning-line odds from the rail out, is: Ever So Clever (Luis Contreras, 20-1), Lockdown (Jose Ortiz, 20-1), Mopotism(Mario Gutierrez, 20-1), Paradise Woods (Flavien Prat, 5-2), Jordan’s Henny (Joe Rocco, 30-1), Vexatious (Kent Desormeaux, 20-1), Farrell (Channing Hill, 5-1), Sailor’s Valentine(Corey Lanerie, 30-1), Wicked Lick (Brian Hernandez Jr., 30-1), Miss Sky Warrior (Paco Lopez, 9-2), Tequilita (Luis Saez, 20-1), Daddys Lil Darling (Julien Leparoux, 20-1), Abel Tasman (Mike Smith, 5-1) and Salty (Joel Rosario, 6-1). Also-Eligible: Summer Luck (Javier Castellano, 30-1). All starters will carry 121 pounds. WEDNESDAY (BY PLANE FROM CALIFORNIA) – Finest City (Ian Kruljac, Barn 24); Ritzy A.P. (Dan Blacker, 9); Union Strike (Mick Ruis, Barn 24). $300,000 AMERICAN TURF (GII) (Entries taken Wednesday, May 3, race Saturday, May 6) – Probable: Big Score, Conquest Farenheit, Holiday Stone, Kitten’s Cat, La Coronel, Made You Look, Oscar Performance, Parlor, Ritzy A.P. DERBYGIVES.COM 50/50 RAFFLE – The Churchill Downs Incorporated Foundation will host a trio of nationwide online 50/50 charitable raffle drawings on Thurby (May 4), Kentucky Oaks Day (May 5) and Kentucky Derby Day (May 6) to help raise money for its charitable initiatives, including Thoroughbred aftercare; arts and educational opportunities for stable area employees; and breast and ovarian cancer research and prevention. Raffle tickets are on sale now at www.DerbyGives.com for $5 in jurisdictions where online wagering is permitted. The winner will receive half of each day’s sale and the other half will go toward the charitable initiative. The Churchill Downs Incorporated Foundation has donated more than $2.2 million and thousands of volunteer hours to charitable partners, including more than $740,000 for education and prevention of breast cancer and more than $140,000 to Thoroughbred retirement aftercare. ENHANCED APP FOR ON-TRACK GUESTS – Churchill Downs Racetrack has launched a new version of its on-track mobile app to provide guests with additional features and information to enhance their experience at the racetrack and The Kentucky Derby presented by Yum! Brands. The new features offer fans easy access to equine, racing and wagering information, as well as up-to-date information about each day’s events and news. Additionally, guests can wager from their mobile device; find parking and get directions to seating locations; skip food and beverage lines in seats where Express Pickup or In-Seat Delivery is offered; and buy, manage and scan mobile admission tickets. The updated app is available at iTunes athttps://appsto.re/us/USS6bb.i and the Google Play Store at https://play.google.com/store/apps/details?id=com.venuenext.churchilldowns&hl=en.